At Johnson's, we believe in stocking top quality blades. We offer a wide selection of quality Pocket, Hunting, and Tactical knives. We are a CASE Platinum and Case Select Dealer. 10% off Case Knives for Case Collectors Club members! 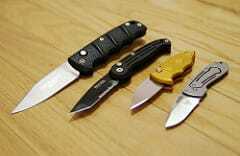 We also have used knives from Robeson, Remington, Boker, and many others. SOG, Spyderco, Kershaw, Swiss Army / Victorinox, KA-BAR, Puma, Camillus, Boker, Benchmade, Timberline, and others.